Tracing bloodlines through time has been a fascinating activity, and understanding where modern sport ability originates is of great value to the breeder. Without knowing which bloodlines are potent in the abilities we desire in our stock we are just feeling our way in the dark. Yes, we can look at conformation and performance as indicators of potential and we should do that, but too often that outstanding sport horse when retired to breeding does not pass on the promise made in its career. Even more confusing, sometimes the horse that proves the best in producing sport talent in offspring is not a champion performer. What a successful breeding horse has is potency--that they are able to pass on the talent of their type consistently. In the British Isles, and then in America, all genetic roads in sport lead back to the ancient racing-saddle horse, the Celtic Horse, which became known as the Hobby. No matter the doctrines spread about the origins about sport ability published by advocates of the European warmblood, true racing and sport stock did not appear until the breeds that carried potency in those original sport horses made it into their gene pool. In looking for the origin of the modern sport horse, I have been taught by history that it is the practice of selective breeding to encourage sport ability and/or the isolation of a breeding population already strong in the sport traits, that have produced the most potent carriers of sport performance we are riding on today. So sometimes it is intentional and intelligent concentration of the bloodlines, and sometimes it is the result of a happy accident of geography and history. The significant breeders through the ages have know this. For example, early American breeder John Hull was a successful merchant who decided to try his hand in creating excellent cattle and horses in 1677. To this end he purchased a peninsula extending into the Narragansett Bay which he named Judith Point. He then gathered the best stock he could buy, including top stallions from Virginia (Running Horses), and then walled off the Point at the end where it met the mainland. He knew to be successful in his quest he had to isolate and protect his stock from contamination with lesser free ranging animals. In doing this he laid the foundation of high quality potent horses that shortly became the base for the Narragansett Pacer--a race/saddle breed that within forty years became famous worldwide for its quality. America has always bred and competed sport horses. The DNA work of the teams led by Vila, Luis and Janson confirmed or turned over long held beliefs on the source of horse populations, and the horses of Ireland and England can be traced back to the northern Iberian Peninsula and the Celtic Horse. In current history we have a strong demonstration of where sport arises shown in the development of the modern warmblood sport breeds, and we find that contrary to their promotional quasi-histories, it is clear that they received their ability in sport from massive crossing in of the breeds of the British Isles. Those galloping racers, the trotting horses, the hunter horses of England and Ireland which were imported in colossal amounts to the continent--all of them carried sport genetics in potency, and when crossed on the heavy agricultural stock of Europe they provided an upgrade first to a heavy coach horse, then a carriage horse and improved cavalry type. Then finally, with tremendous additional importations of the racing Thoroughbred and Trotter stock, it was only then the European sport type emerged. Thankfully this has happened recently enough so the revisionists can't alter the record. This transformation into a sport horse did not occur until the genetic fabric of the European horse was converted to one that contains a potency in true sport genetics. Working backwards in time for the origin of the American sport breeds, we find the source returns to the English Running Horse and Irish Hobby importations into our colonies--the difference between us and Europe is that we did not have a draft horse base--instead we started horse breeding with the highest rated sport horse in the world. So our original stock was sport horse, and it was isolated, especially in the Virginia colony for a hundred years before even the English Thoroughbred got to America (read a detailed history of colonial sport horse development in Standardbred Sport Horses). Later on we too received English Thoroughbred, Trotters and the Hunters of Ireland and England onto our original gene base--so it was sport genetics added onto sport genetics. Our horses began with a very homogenous mix of sport genetics, and very little else was brought in to our stock. By the time the floodgates opened in international trade of horses, we had already established many pure-bred breeds based on concentration of the original Hobby traits that each area desired--therefore our native breeds are brimming with potency in those traits. A closed breeding population equals potency in its genetic factors. The American horse was first and foremost a sport horse--a racer, a hunter and a saddle horse--a mirror image of its Hobby ancestry. In the meantime, England had almost totally destroyed its Running Horse and Hobby populations in political purges (English Civil War), leaving us in America with the largest cache of Hobby genetics in the world. The key to understanding the American sport breeds versus their European counterparts is to comprehend their base components. 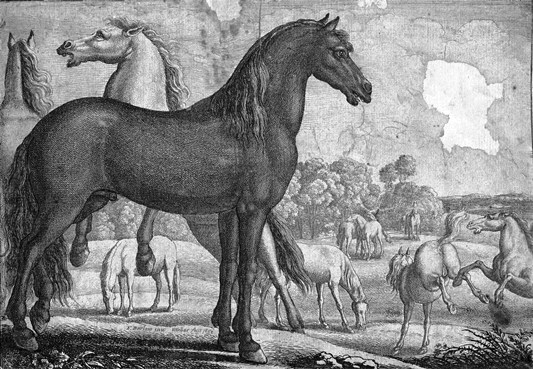 The English Running Horse was based on the Celtic Horse--arriving via Phoenician ships with later genetic inroads of Saxon, Norman and Barb stock. The Irish Hobby was almost totally pure Celtic Horse and being contained on an island and further out to sea than Britain, it received less infiltration from the mainland of Europe--only what arrived in ships. The result of this isolation was the Irish gene pool was more potent in what the Celtic Horse brought--which was speed, stamina, athleticism, riding horse gaits, docile temperament and it then follows that our American stock is of those same genetics--kept undiluted. Because the Irish Horse was kept in a closed environment for more than a thousand years, as a gene pool it was an extremely potent source of those traits--probably at a level of potency few if any other horse communities have equaled. And here is the key concept: what it was potent in was sport genetics. It was not just because of its immense speed, but because it could pass it on reliably that it was imported by the English aristocracy for racing and saddle use, and to upgrade their own sport stock, which had suffered some loss of talent from mixing with other strains. 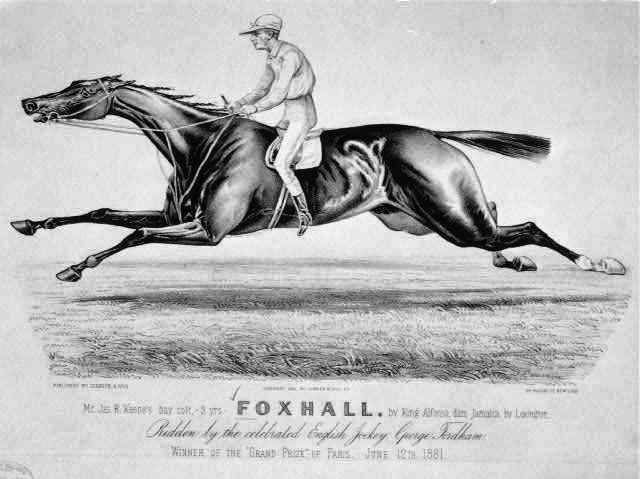 The Irish Hobby and the English Running Horse became the base of the English Thoroughbred--the base was not the Oriental horse--DNA has overturned that fairy tale (Bower/Hill). The Hobby is also the foundation of the Irish Draught and Connemara Pony, and the Thoroughbred shares 68% of its genes with them--they arose from a common ancestry. It is also the source of our American breeds, not just our racing Thoroughbred, but the Standardbred, the Quarter Horse, the Morgan and our saddle breeds as well. All of our horse populations that directly descend from those concentrated carriers of the sport ability are today a warehouse of those same genetics---see American Breed Development. As the 20th century dawned another interesting thing happened---which proves once again that it was the potency in those original genetics that made the difference. American sportsmen took our native sport horses starting in the mid-1800s and traveled to England, Ireland, France and beyond to compete with our counterparts. Our American Trotters, Running Horses and Hunters made the trip, then later when the new breeds of American Thoroughbred (1868) and Standardbred (1879) were formed--they too made the journey. Up until that time we had been relatively isolated from the influx of their stock and performance ability. Did we find that our horses couldn't stand up to the test against those superior European and English horses? No, the opposite happened; our Trotters completely slaughtered the competition, winning against the existing trotting breeds of French Trotter, Orloff and Norfolk Trotter. The end result was our Trotter and later Standardbred (after 1879) were imported in massive numbers for breeding stock for all nations that raced trotters (see Standardbred Sport Horses), and to a one they all today carry tremendous amounts of American blood. It was because our Trotter (and Pacer) was faster (speed gene) and could hold the mid-gait (gait-keeper gene) at high speed much better than the continental stock.Today the mid-gait racing world is dominated by American genetics--the new international Trotter is usually 75% to 100% American Standardbred. Plus our Trotter was always an excellent Hunter, and many of them are found in European jumping horses. What happened with our Running Horse and later the Thoroughbred was even more dramatic. With relatively few horses making the trip, our horses so upset the Thoroughbred establishment by winning all the top races repeatedly over time, including steeplechase, and then the American stock that stayed there and bred on were doing the same; it was just too much of an affront. The English Jockey Club mounted an organized assault on our industry to not just send us home, but to ban us from international breeding--the aim was to destroy our breed. This campaign was formalized in the Jersey Act, which banned our Thoroughbred from the studbook--read all about this event, why and how it was carried out, and then the unexpected consequences in Legacy of Lexington. Why were our sport horses so much better? It was because of our potency in the original sporting stock. Genes don't change--they travel down through the generations unchanged and even in clusters (Bowling, Horse Genetics), so when a population of horse is potent, and then it is kept that way, then you have the undiluted essence of that ability right there---so it performs at the top level and it can pass it on. What this means for the American breeder of sport horses is you have the deep well of sport right in front of you. When the Jersey Act was put in place (1913-1949), it had the unforeseen result of re-concentrating the every elements the British were trying to extinguish--because our horses were forced to stay at home and therefore became inbred in the very same bloodlines. When the edict was lifted, the American horse once again conquered the world gene pool of racers--with individuals like Sir Ivor, Roberto etc. and then improved their horse populations with stallions like Sadlers Wells, Mill Reef and Never Bend. I'll bet no one has been telling you any of this, but you need to know it to be successful, and so you can stop listening to foreign 'experts' who know nothing about our breeds or what they actually contain. The truth is our domestic horse breeds are carrying the genetics we need, and with a understanding of the bloodlines and how to build potency we can crank up the sport genetics in our own products far easier and far beyond what other breeders can do--we have it all here--in potency. That is why I go to such lengths to bring you this knowledge, we have it all here in concentration already, we need only to identify the bloodlines we desire and which horses are potent in them, and cross them in. The DNA work of Dr. Bower and Dr. Hill with their respective teams of geneticists uncovered that it was indeed the 'native English mares' of the early racing studs that supplied the speed gene to the Thoroughbred. This work is of course couched in the 'wild horse theory' and so they classified the speed gene as a mutation, and said it only entered the population once. Now, could those sport and speed genetics that were evident in the Celtic Horse have been spread into other populations of horses? Of course they could--the key is potency, if the other horse groups did not do selective breeding to keep those traits undiluted, or if by geography they were not isolated, then the precious sport genetics documented in this ancient breed were dissipated. Could a horse not descended from Hobby stock be a good sport horse? Sure, any horse can get a lucky shuffle of the genetics into its phenotype, which is why even in grade horses there is sometimes a super star. But can they pass it on or can you repeat the genetic outcome by breeding a full sibling? Not likely. Today we are in a global territory; horses from distant lands can be stabled right next to our native breeds. There is a tremendous mixing of bloodlines, and now it is the 'international sport horses' --but the source of sport ability has not changed--the sport genes are still the same. As breeders we need to increase our odds of success in consistently producing excellent stock for our sports of choice. And to do so in this international market place we need to use every tool at our disposal--the chance of gene dilution is immense. Tesio Methods is a statistically proven way to increase potency, but it requires that you understand the bloodlines to target. So we all need to do our homework, even in this global gene pool, we need to know which breeds and which bloodlines are POTENT in the traits we are aiming for. How do we go about doing this? First, we need a comprehension of what our breeding stock contains and which of those genetics our horses are already potent in, along with a clear idea of which of those lines you would like to build additional potency in. The way to do this is outlined in Understanding Pedigrees, and a more comprehensive--step-by-step instruction is found in North American Sport Horse Breeder. I have prepared an article on the Irish Hobby for your understanding on the base root stock, and I have attached an outline of American sport breeds as well. That should get you a surface understanding, but I do recommend that you learn your bloodlines, the talent, the soundness, the speed, the stamina etc. and I have provided some of that information in Stanardbred Sport Horses and Legacy of Lexington.